Fortunate enough to visit California many times in my lifetime but had never been as far south as San Diego until Autumn 2017. Southern California is the perfect place to take a break before the holiday rush begins. The perfect summer day can be found frozen in time in small coastal towns such as La Jolla. Nothing beats the 70*F days in Autumn, cool breeze off the Ocean and fresh produce at La Jolla, California. In today’s share you will find my Must Visit In Southern California | Sugar and Scribe Bakery Review. Special THANK YOU to my garden writer friend Nan Sterman for recommending Sugar and Scribe Bakery. Amazing views like the one above make La Jolla Cove in Southern California a perfect place to just sit! The waves crashing up on the shore below is super soothing. During my first visit to Southern California, I had my big ‘professional’ camera with me but found myself using my iPhone primarily for photographs. While on vacation I recommend uploading images taken during each day on your mobile device to a Flickr or Google photo account while on a secure wifi connection. Downloading photos off of the device helped keep me organized when trying to find a photo from vacation and also stopped my iPhone from getting cluttered. Is there anything worse than having over 5K photos on your mobile device – been there! Below you’ll find the photos featuring a few of my favorite sights outside the Sugar and Scribe Bakery. The neighborhood made me feel like I was back home in NW Ohio visiting one of my favorite local restaurants just waiting for a friend to meet up. It was October and I’m from Ohio enjoying reminders of summer such as the sunshine, cool 70*F breeze and cozy surroundings on the patio. Everything from the cushions to the coffee cups with initials made me feel right at home. As for the food, during the 6 days we spent in La Jolla we had brunch at Sugar and Scribe Bakery 3 times! Veggie Benedict featuring poached eggs and fresh greens is a dish I had twice during my stay. A pastry to go is a definite must but good luck picking just one. The menu is so delicious and filled with healthy meals I forgot that it Sugar and Scribe is a bakery! Featured below are some of the cakes they had on display during our visit. Click on the Google Map Above to find Sugar and Scribe Bakery. In conclusion, here are the current links to active social media shares featured on Facebook and the current menu can be found on the creative website. 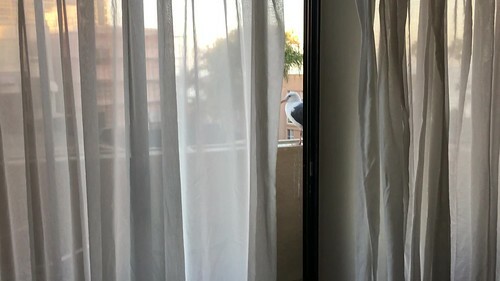 Below is a video I took of the little bird that would sit outside our patio each morning while staying in La Jolla. The little sea creature was just so cute I had to share this with you! Find this video on my Flickr Collection: La Jolla by Bren Haas on Flickr. Do you have a favorite restaurant or bakery that has inspired you to create a recipe at home? Connect with me by leaving a comment on the contact page or in the post.